At birth, the Creed queen was named Tessa Lynne Thompson on October 3, 1983, in Los Angeles, California, in the United States. She is of mixed ethnicity, her father is of Afro-Panamanian while her mother is of Euro-Mexican heritage. She holds American nationality and the only known child of her parents. For her educational pursuit, Tessa Thompson was a student at Santa Monica High School. There, she was quite active with the school’s theatre group and was a brainiac. She proceeded to Santa Monica college, graduating with a degree in cultural anthropology. Upon graduation from college, she ventured into professional acting and made her debut appearance in The Tempest. She took a chill pill for a few years before appearing in the stage play; Romeo and Juliet. That role gave her the NACCP Theatre Nomination that year. She subsequently made an appearance in a few television drama series in 2005. Her performance in CBS series, Cold Case cemented her place in the ABC medical drama series; Grey Anatomy. In between her role on the medical drama series, she played as Jackie Cook on Veronica Mars. In 2006, she starred in the drama series Hidden Palms and also appeared occasionally in Life and Private Practice as well as Heroes. While she appeared in Detriot 187 (2010), it became the platform her fans used in watching most of her remarkable acting stints. Also, she starred in other shows like 666 Park Avenue, Copper, and Westworld. Tessa Thompson has only had a few film roles but has done well to greatly impress at all of them. Her first film debut was in the horror film; When A Stranger Calls. She later played as a dancer in the movie, Make It Happen in 2008 and starred in For Colored Girls (2010); a Tyler Perry stage play. Onwards, Tessa appeared in movies like Dear White People, The Grand Romantic, Thor: Ragnarok, Annihilation, Sorry to Bother You, Creed, Creed II and Men in Black: International. As a musician, Tessa was a member of the band group, Caught a Ghost. She also contributed to the soundtracks for Creed and Creed II. The star actress was born into a home that had a passion for theatre acts. Her flair for the world of arts was cultivated within the realms of her home and there, she gradually molded her acting career and developed the desire to be one of the finest actresses in the world. Her father, Marc Anthony Thompson, though not publicly recognized was said to have lived his life as a singer and songwriter. 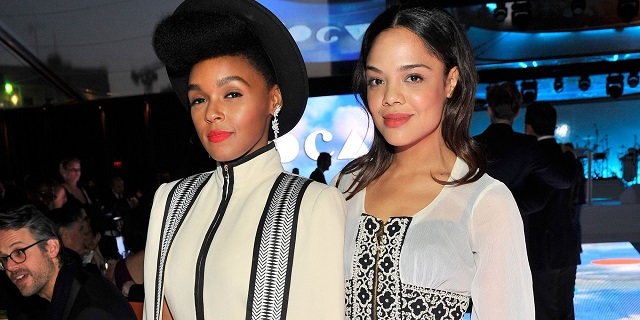 From what we know, Tessa Thompson has never been married. However, she has had one or two flings and relationships, here and there. Her then-relationship with Ben Crowley was heavily publicized but sadly, they called it off even before it began. In 2015, she shared a romantic hoax with Jack Gilinsky. Tessa’s sexual orientation has been best described as complicated. The star actress in an interview with Porter Magazine in June 2018, publicly stated that she is bi-sexual, that is, she is both attracted to both the female and male folks. Shortly after the news of her confession went viral, she became the gist of town. While a lot of her fans were trying to digest the news, she appeared in the singer, Janelle Monae music video, Make Me Feel. Her seductive display in the video gave rise to rumors of her relationship with the singer. While most of her fans had their fingers crossed, the actress replied in a tweet that the singer is just a friend but however, if they decide to date, they owe no one explanations. As it stands, Tessa claims that she is currently single and is not looking out to date. Despite her thick muscular build, Tessa Thompson’s curvaceous body physique is easily noticed. Standing at 5 feet 4 inches, she is of average height. It is believed that she measures 34-25-36 inches for her hips, waist and bust sizes respectively. She weighs 55 Kg.